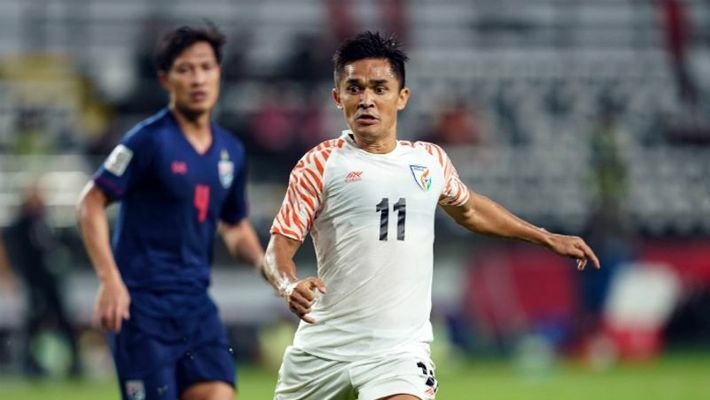 Abu Dhabi: India showcased tremendous grit to outclass Thailand 4-1 in their opening match of the AFC Asian Cup 2019 at the Al Nahyan Stadium on Sunday. The Blue Tigers registered their biggest win in the tournament and also their first in the Asian Cup since 1964. Sunil Chhetri broke the deadlock with a penalty in the 27th minute before Teerasil Dangda gave Thailand hope with an equaliser. The joy did not last long as Chhetri struck again soon after the break with an excellent first-time strike to restore India's lead. Anirudh Thapa extended the lead in the 68th minute and Jeje Lalpekhlua scored after coming off the bench to be part of a historic win for India. Thailand had the upper hand in the opening stages of the match but the Indian defence and Gurpreet Singh Sandhu were alert to their opponents' clever moments off the ball in the attacking third. Full-back Tristan Do's set-piece skills threatened to break the Indian resistance in the 21st minute. Sandhu, though, managed to deflect the ensuing shot and Anas Edathodika was at hand to clear the danger. A quick throw-in by Chhetri from the left flank in the 26th minute caught the Thailand defenders unaware and Ashique Kuruniyan surged into the box with his eye firmly on the goal. Theerathon Bunmathan, in a desperate attempt to halt the FC Pune City winger's run, handled the ball inside the box and conceded a penalty. Chhetri stepped up and converted to score his third AFC Asian Cup goal. Thailand head coach Milovan Rajevac sought a response from this team and the War Elephants hit back in the 33rd minute. Bunmathan made amends for his mistake at the other end with a peach of a free-kick delivery into the box from the right flank. Teerasil Dangda leapt high in the centre of the box and placed his header past Sandhu. The Blue Tigers, though, blazed into a 2-1 lead within seconds after the change of ends. Anirudh Thapa nicked the ball off Chanathip Songkrasin on Thailand's left flank and played the ball forward. Chhetri initiated a well-crafted move, releasing Udanta Singh into space down the right flank. The Bengaluru winger crossed low into the box for Ashique who flicked it on for Chhetri who finished the move with a stunning first-time effort into the top left corner of the net. India pushed forward and showed plenty of desire to add to their goal tally. They doubled their lead in the 68th minute with a quick break after Teerasil Dangda lost the ball in midfield. Chhetri split the Thai centre-backs with an excellent through-ball to release Udanta into the box. The winger laid the ball off for Anirudh who chipped the ball over the goalkeeper to make it 3-1. India crushed Thailand's hopes of a late comeback with a fourth goal in the 80th minute. Chalermpong Kerdkae headed clear Udanta’s cross straight into the feet of Halicharan Narzary who picked out substitute Jeje Lalpekhlua at the edge of the box with a quick pass. The Chennaiyin striker slotted the ball past the goalkeeper to script a historic win for the Blue Tigers in Asia.